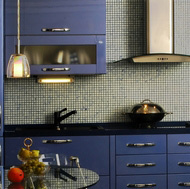 Choosing from a variety of kitchen backsplash ideas can be an enjoyable and visually rewarding experience. 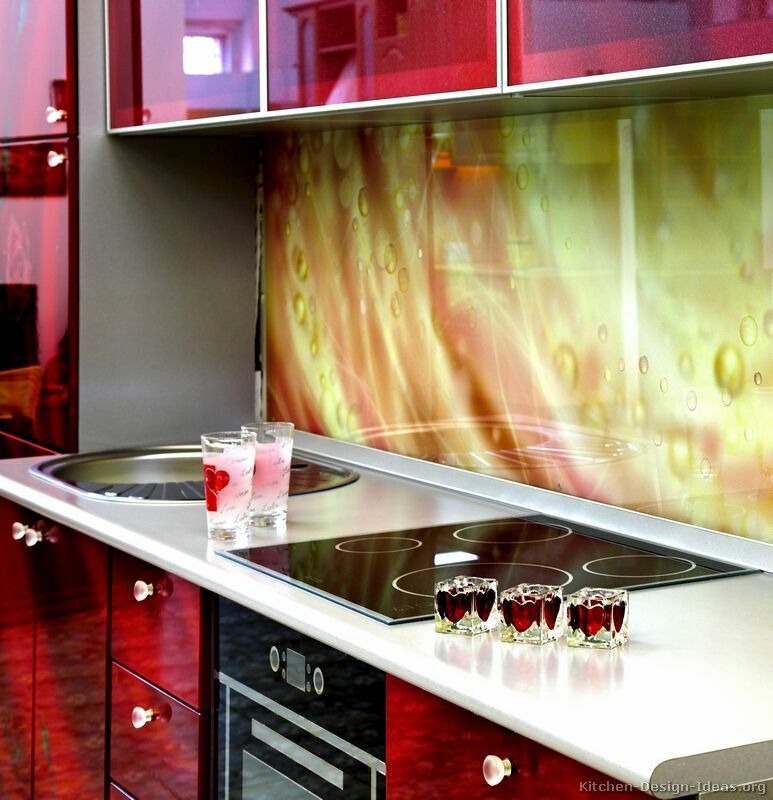 From natural stone tile to mosaic marvels to photo-printed glass, the possibilities for your kitchen are virtually endless. 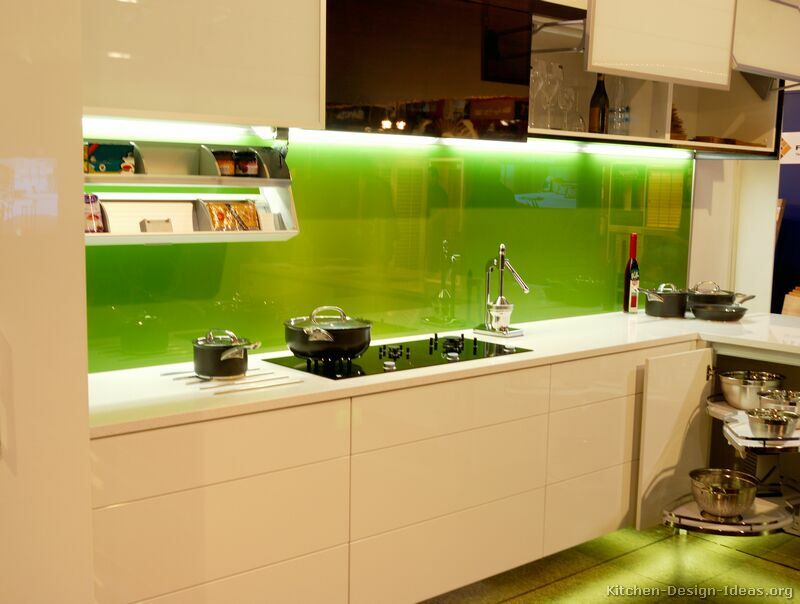 Below is a collection of backsplash designs, materials, and functional options for you to consider for your kitchen. Feel free to print or save your favorite kitchen backsplash ideas, and be sure to discuss these options with your designer and contractor to find the right fit for your kitchen style, color scheme, and budget. 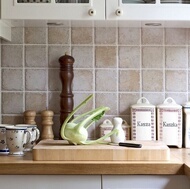 Here are some of the most popular kitchen backsplash materials in use today. From man-made ceramic tile to quarried natural stone tiles such as travertine, marble, limestone, and slate, tile backsplashes are by far the most popular option for today's kitchens. For extra character and dimension, consider a tumbled travertine or tumbled marble backsplash in which the tiles are worn down with sand to create a softened, less uniform appearance. For a perfectly smooth surface that can practically be hosed down when cleaning, a full granite backsplash is a top choice. In this case, the backsplash is cut from the same slab as the countertop so the pattern flows continuously from the counter on up. Silestone and quartz are also common, while slabs of marble, soapstone, and onyx are more exotic backsplash choices. If you're looking for fresh, cutting-edge kitchen backsplash ideas, look no further. 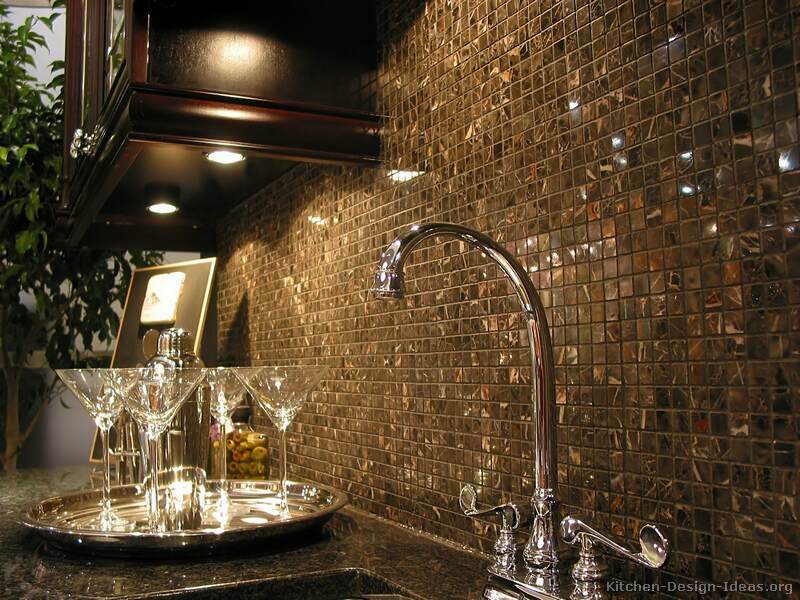 Glass tile and glass mosaic backsplashes have skyrocketed in popularity in recent years, either as accents in a mixed-material backsplash or occasionally as the entire surface. 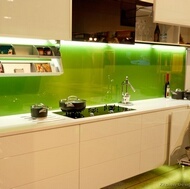 For modern kitchens, an easy-to-clean solid glass backsplash can be custom shaped to the wall. The pane can be mirrored or back-painted glass, or even printed with a photo or mural! 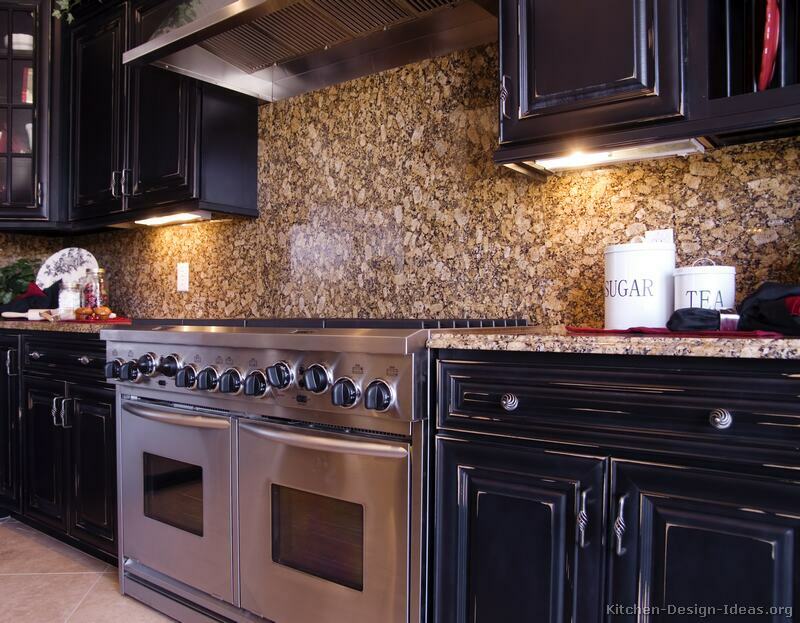 For the pro chef, nothing tops a stainless steel backsplash behind the range. It's fireproof, sanitary, and easy-to-clean. 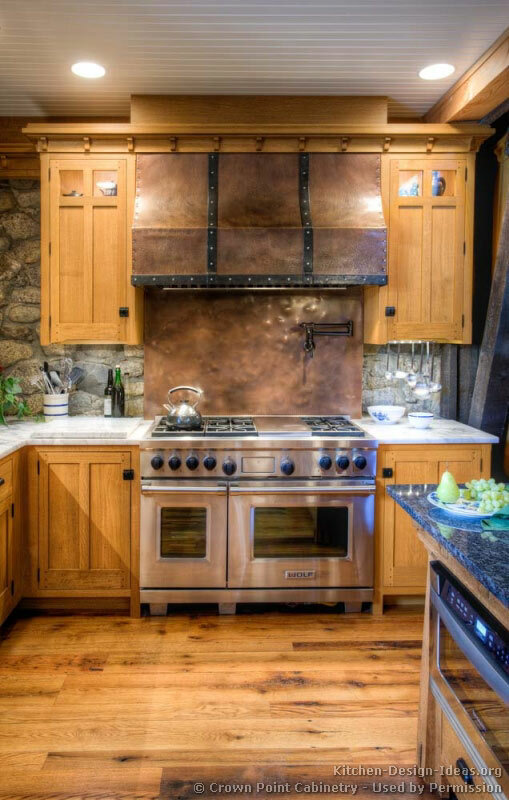 Decorative metal is also a growing trend in today's backsplashes, with copper, tin, and metal tile picking up steam. Decorative metal backsplashes often come with pressed patterns or in a dramatic patina, so it's advisable to step back and consider the overall effect to keep them from visually overpowering the room. For kitchens with solid surface countertops (Corian) or laminate (Formica), a matching Corian or laminate backsplash is an option. Vinyl tiles, available at home stores, mimic the look of stone and ceramic tiles and are often self-adhesive for DIY installations. 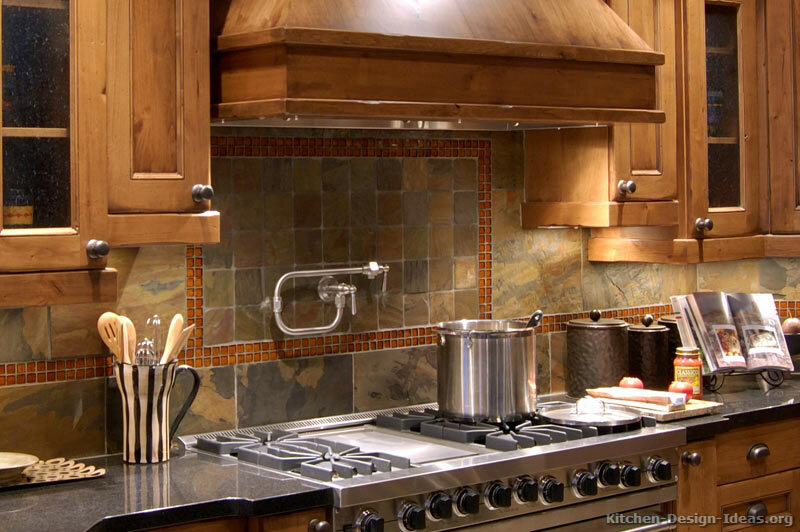 For a faux metal backsplash, look for thermoplastic products that resemble pressed tin and copper. 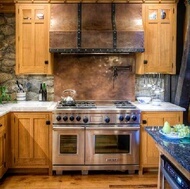 While wood is not fire safe to use behind a cooking surface, there are often other areas in a kitchen where a wood backsplash can provide a warmer appearance. 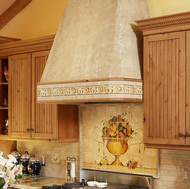 For country and cottage style kitchens, a beadboard backsplash looks terrific behind a built-in hutch or open cabinetry. 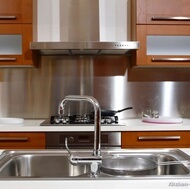 Even a painted backsplash can work for any area away from sinks or cooktops. 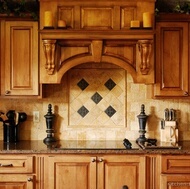 In a timber frame, log home, or rustic kitchen, sometimes a "normal" backsplash just won't cut it. 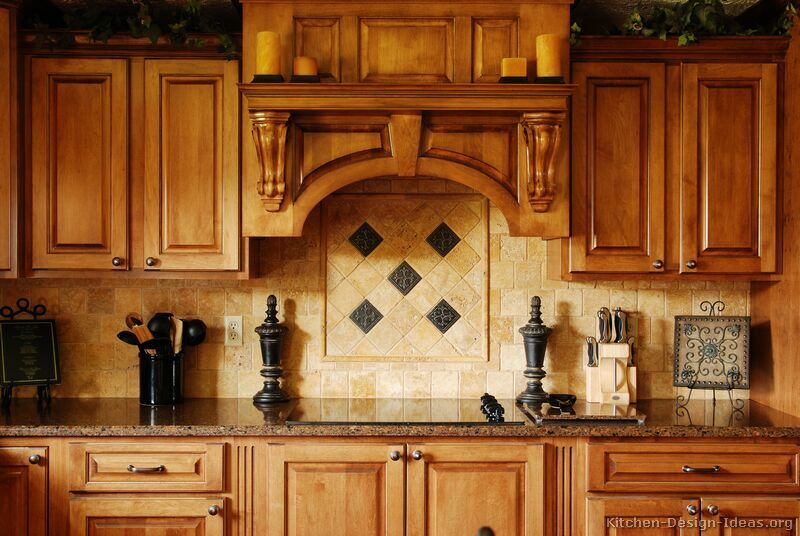 Depending on the desired look, a brick or stone kitchen backsplash can add serious impact. 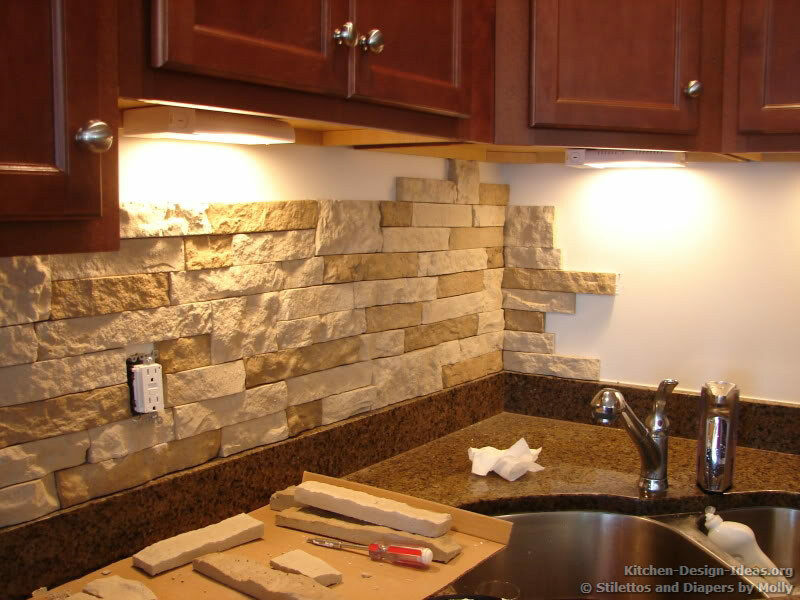 For an "outdoor" ambiance, a cobblestone or stacked stone backsplash can be installed on an entire wall or along the back of a kitchen island or peninsula. Once you've decided what materials and colors you want for your backsplash, it's time to determine how to put it all together. 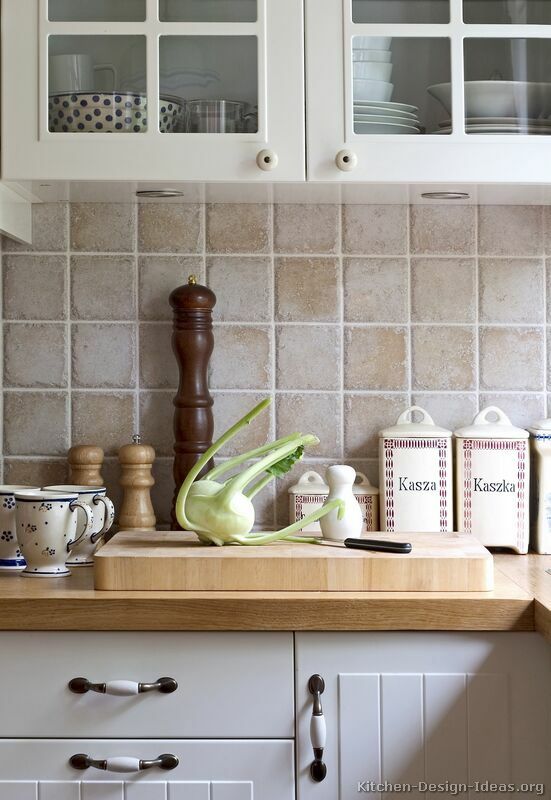 If you choose tile, do you prefer a consistent pattern (say, square or diagonal) or will you mix it up in some way? 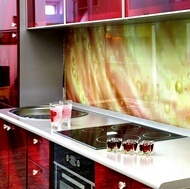 Here are some kitchen backsplash ideas and designs to spark your imagination. Breaking up the tile pattern behind the range is a great way to add interest and a focal point to the room. This can be done with a simple border tile to section off a rectangular area below the hood, or by changing the tiles altogether. 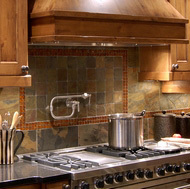 Purchasing a tile mural or mosaic design is another way of highlighting this part of the kitchen. If your sink happens to be in front of a wall instead of a window, you will want to decide whether to keep the same tile pattern as the rest of the kitchen or to mix it up. The same general design principles apply behind a sink as they do behind a range, so you can change the backsplash here with an easy-to-clean stone slab or add a design feature with a border tile or mural if you wish. Depending on the style of your kitchen, an artistic mural can add both a point of focus and a conversation piece to the room. 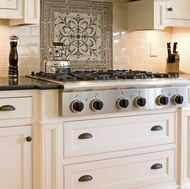 It's one of the most popular kitchen backsplash ideas for Tuscan, country, and French country kitchens. 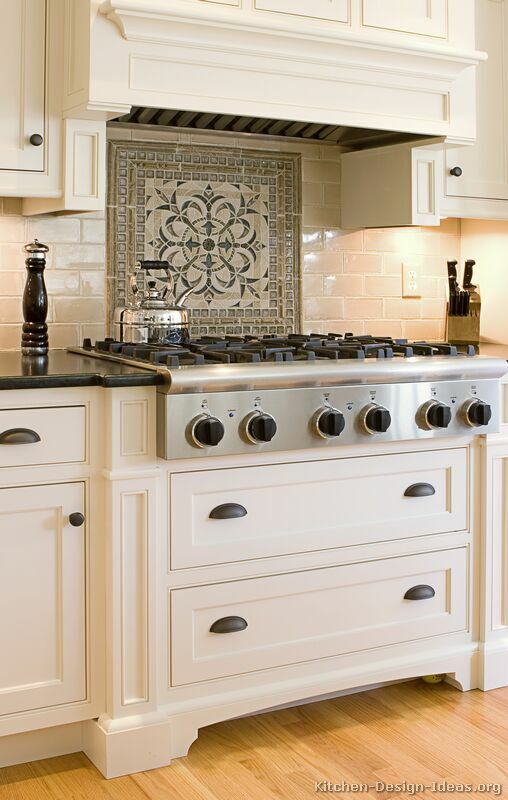 With an appropriate period design, a tile mural can be used in Craftsman kitchens as well. 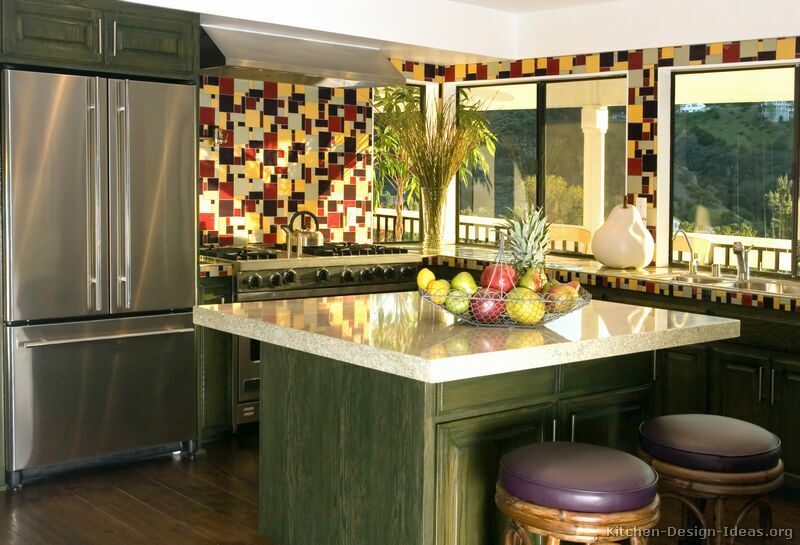 An artistic mural is not always appropriate in a modern or luxury home, so to spice up the look, you might consider kitchen backsplash tile designs that are more abstract. These are often available pre-packaged from specialty tile stores, although it is possible for a creative artisan to design one from scratch for your home. From a simple rectangular tile design to multi-tiered bands of varying shapes, the sheer number of backsplash tile patterns is staggering. For any given material, there are often dozens of possible sizes and shapes to choose from, and near infinite ways in which to combine them. While it's easy to over-complicate things, I often recommend starting simple and then adding some variation as needed. Sometimes smaller is better. Mosaic backsplash tiles are usually 1-inch or smaller, and typically come in 12x12-inch pre-formed sheets to make installation much easier. The tiles can be all of the same material, or can be ordered in randomized patterns from specialized tile retailers. 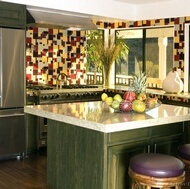 Arizona Tile's Custom Blend Tool allows you to generate your own special-order mosaic pattern online. A growing trend in backsplash design is the customized look, be it with screen-printed tiles or photographic glass backsplashes. A number of companies now offer custom large-format printing on the back of glass panels that have been custom fit to your walls. The result is a unique design that is entirely your own. 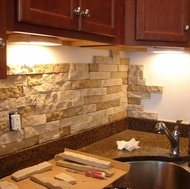 If you have a limited budget or have some extra gumption, a "Do It Yourself Backsplash" could be the way to go. Compared to the skill set required for a professional backsplash installation, there are a handful of easy backsplash ideas for the DIY type. Check out the various peel and stick backsplash options at home stores, including faux tile and other inexpensive backsplash ideas. 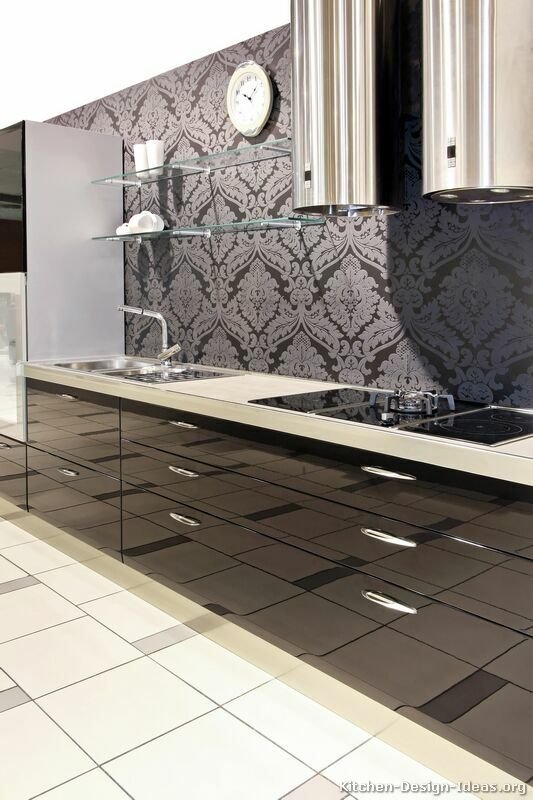 Some designers will cover an entire wall with tiles, either for dramatic effect or "industrial" cleanability. 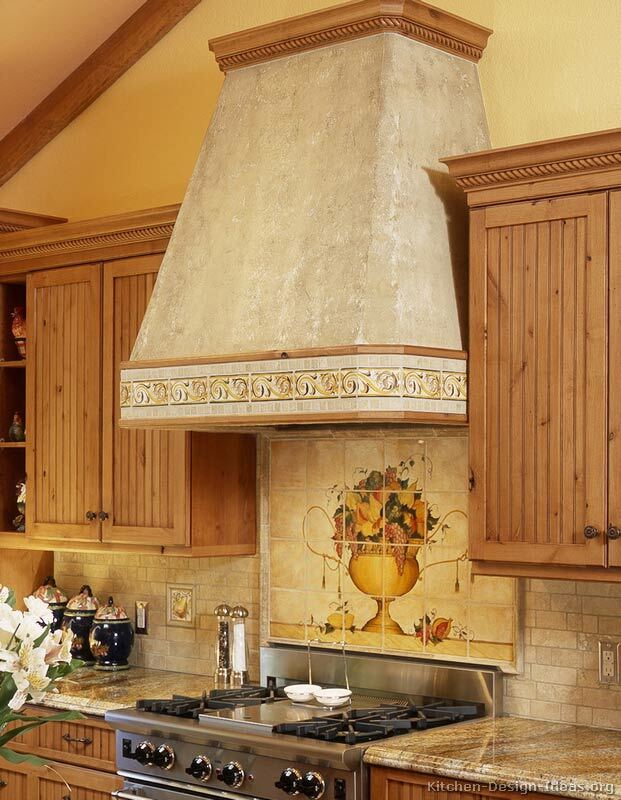 In some instances, the tile is installed up to the ceiling around a shaped range hood where there is no other logical stopping point. 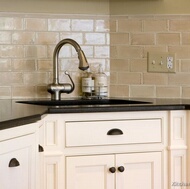 Others use kitchen wall tile as a visual accent wall, much like painting one wall darker for effect. Either way, the result can either be impressive or overwhelming, so proceed with care! In large kitchens where the kitchen sink is some distance from the range, the luxury of a pot filler faucet becomes more of a necessity. 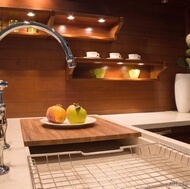 This articulating faucet is installed in the backsplash above the range, and swings out to fill a stock pot with water. Two valves, one at the base and one at the end, prevent turning it on by accident. With a variety of styles and finishes now available, many homeowners find pot fillers both attractive and useful. 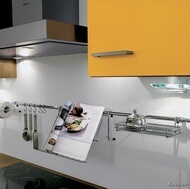 Functionality is a key ingredient in any new kitchen. 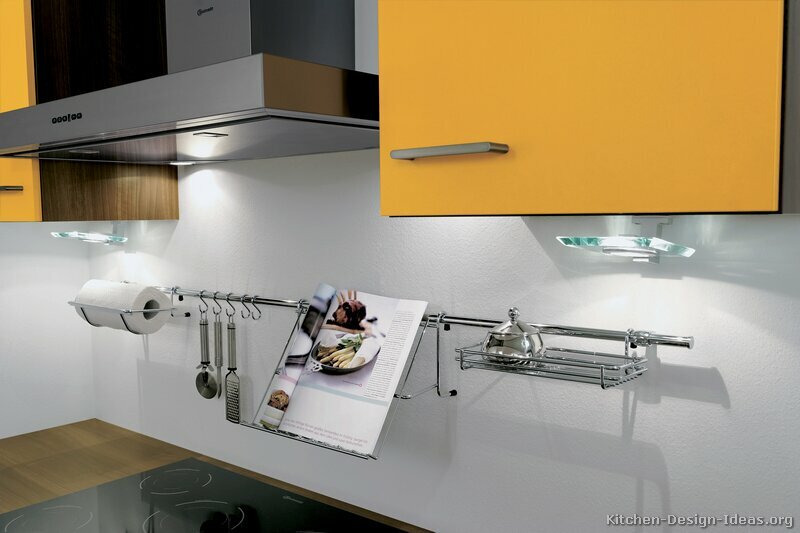 Efficient use of space is the hallmark of modern European kitchens, as residents seek to maximize their storage options in small spaces. 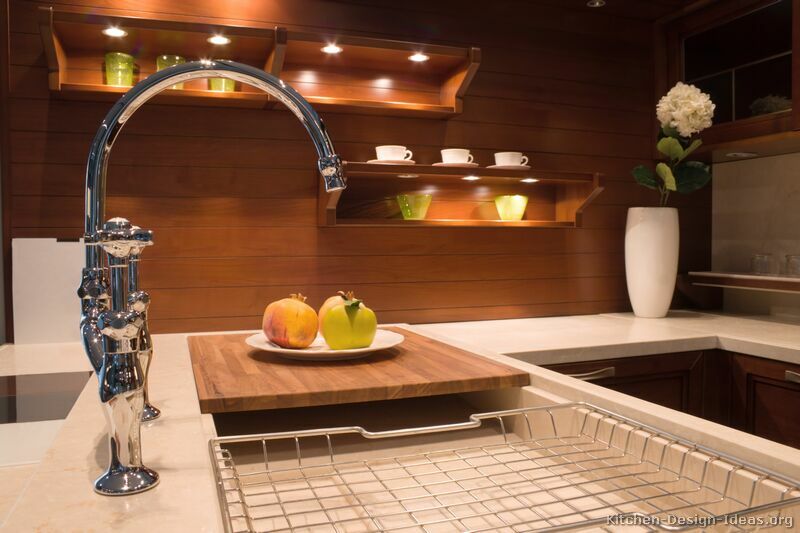 Today's backsplash storage options are versatile and diverse, ranging from cookbook stands and paper towel holders to spice racks and utensil hooks, all positioned for quick access and easy reach. If you feel a little overwhelmed by the number of kitchen backsplash ideas, don't worry. 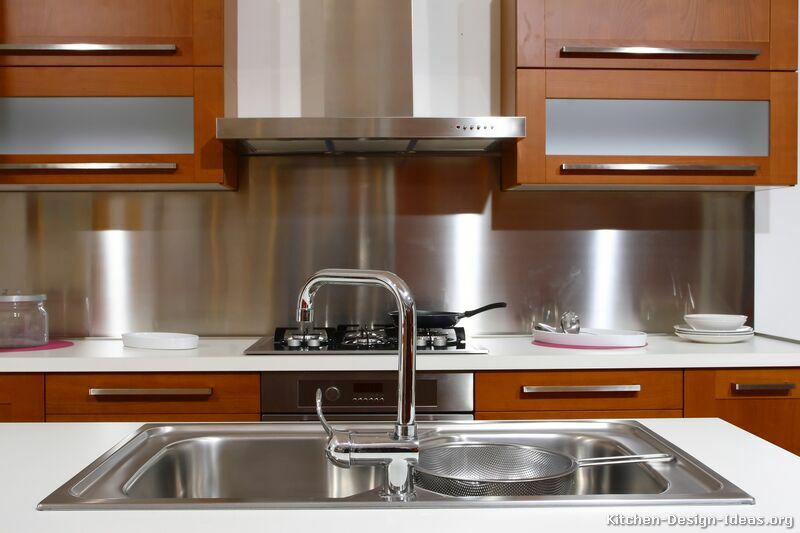 Because your backsplash is usually installed toward the end of the remodeling process, you generally have more time to decide on a backsplash for your kitchen. 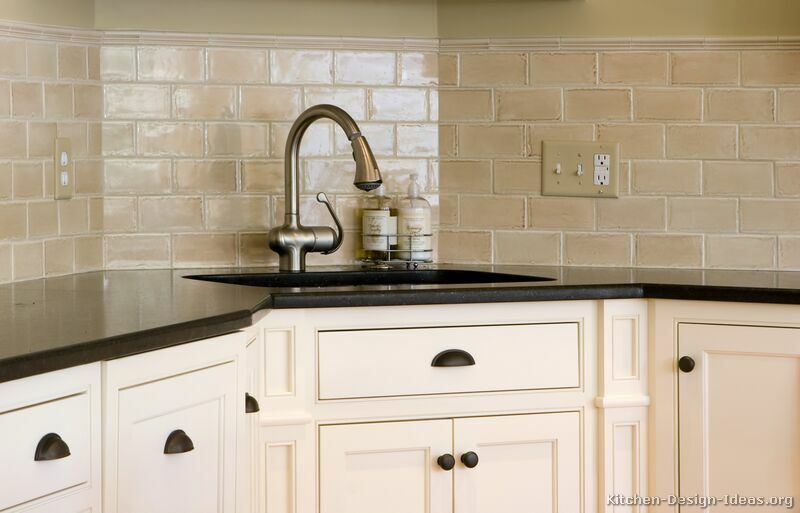 Some homeowners even wait to select a backsplash until they have lived with their new kitchen for a while, since most kitchens can function without one. If you have trouble finalizing your choice, ask your contractor if you can take some extra time to sort through your kitchen backsplash ideas to avoid making a hasty decision. 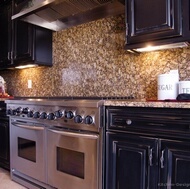 When choosing a backsplash, it usually helps to hire a designer or enlist a trusted friend for advice. 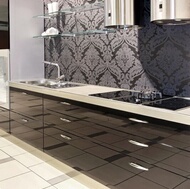 For even more inspiration, check out our kitchen backsplash ideas on Pinterest. 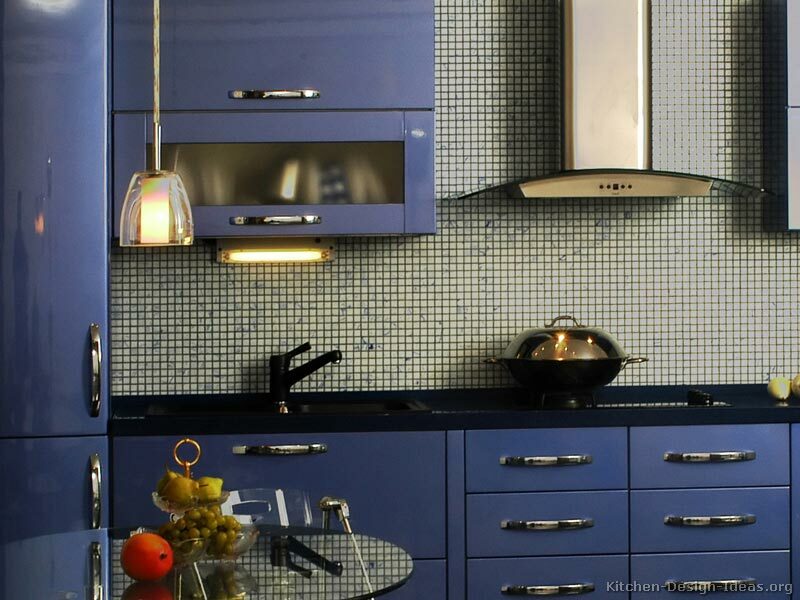 More Kitchens: Find many more pictures of kitchens in dozens of colors and styles.